You need these potatoes on your Thanksgiving table. No, I'm serious. NEED. THEM. Recently I was at a local restaurant with some girlfriends, and one of the dishes was served with brie mashed potatoes. I don't even remember what the main dish was because the potatoes were so damned delicious. So creamy, so buttery, so subtly cheesy. I asked the waiter what was in them (besides the obvious... brie), and he told me sour cream. This got me thinking. I already make my mashed potatoes with crème fraîche, which is basically a more fancy and tasty version of sour cream. I decided I would make my own recipe, but add some triple creme brie to the mix. 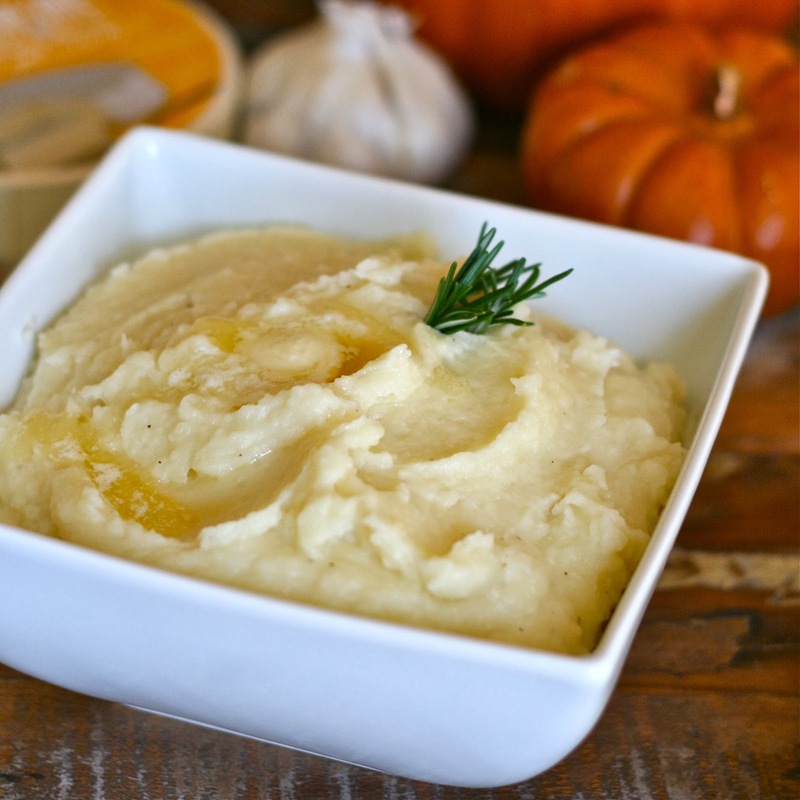 Want the ultimate proof that these potatoes need a spot on your turkey day spread? My brother in law, who doesn't even eat potatoes normally, ate these and loved them! So there you have it. BIL-approved. You NEED these potatoes. 1.) Get yourself a potato ricer. And don't let those potatoes anywhere near a mixer or electric device. Simply rice the perfectly cooked potatoes, stir in the ingredients and serve. That's it. Don't over-stir either. 2.) How do you get perfectly cooked potatoes? Start with really starchy ones like Russets or Yukon golds. Cut them into even chunks and cook until a paring knife easily pierces the potato. 3.) When adding ingredients such as cream, crème fraîche butter or cheese... make sure they are room temperature or slightly warm. (I cut the rind off the brie... about 5 ounces, and cut into little chunks. I kept them at room temperature and stirred into the hot potatoes, along with the other ingredients). 4.) Taste test the potatoes... make sure they have plenty of salt... and butter (add more if necessary). And it never hurts to serve them with an extra dollop of butter. Because you can never have enough butter. Especially at Thanksgiving. 5.) Serve hot! 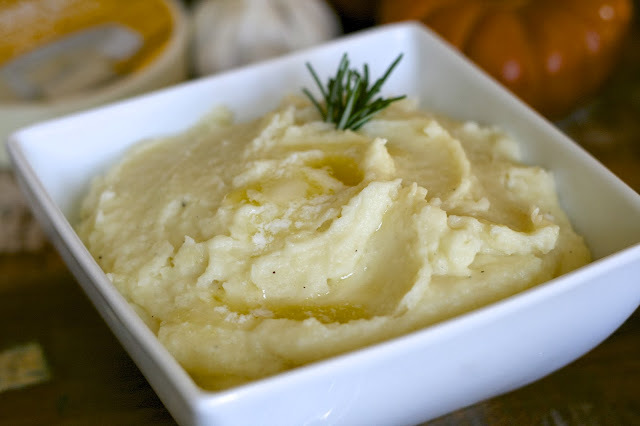 Mashed potatoes are best enjoyed immediately. Enjoy! Happy Turkey Day everyone. Preheat oven to 350 degrees. Cut the top off the head of garlic and drizzle with olive oil. Loosely wrap in foil and roast in the oven for 45 minutes to an hour. Cool and pop cloves out of the skin. Mash with a fork. (Do ahead step: you can roast the garlic the day before if you are making for Thanksgiving). Peel the potatoes and remove any eyes. 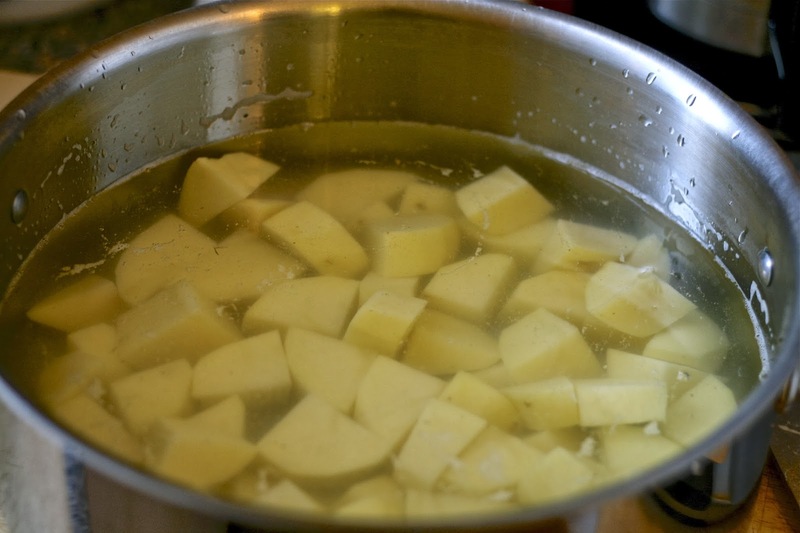 Place peeled potatoes in water while you peel the rest of them so they don't oxidize. Then cut each potato into 1.5" to 2" chunks. Place in a pan and cover with cold water and add a teaspoon of salt. Place over high heat and bring to a boil. Reduce heat and simmer for 15-20 minutes, or until easily pierced with a sharp knife. Remove from heat and drain immediately. Return to the pan and sit them back on the stove to let them dry out a little. (This will help make for creamier potatoes). Meanwhile, warm the butter and half and half in a small saucepan on the stove over low heat until butter is melted. Working in batches, scoop the potatoes into the "hopper" of the ricer and push them through. Stir in the brie and butter mixture into the hot potatoes so the cheese melts. Season with roasted garlic (you won't use all of it), salt and pepper to taste. Finally, stir in the crème fraîche. Serve hot! B is for: Brine or not to brine?